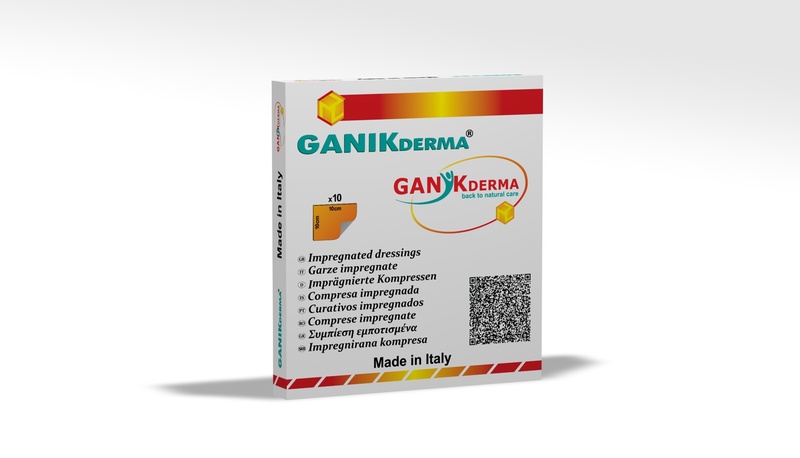 GANIKDERMA® Impregnated Dressing is a hydro-active product, consisting of an absorbent support impregnated with and optimal amount of natural wound ointment, covered on both sides with protective sheets, packed in individual envelope. The wound must be cleaned with hypertonic solutions (physiological serum, Ringer solution), before each use of the impregnated dressing. The impregnated dressing is applied in a single layer directly on the wound, after removal of protective sheets. The compress can be cut using a sterile instrument to match the dimensions of the wound. A sterile compress (gauze or nonwoven) is applied on the dressing which protects the favorable environment to healing produced by the ointment. The dressing is replaced every day or every two days, depending of the wound. In case of larger surfaces of the wound, more impregnated dressings can be used; the borders of the dressings must to be 6-8 mm overlay.